Items in the File Storage trash folder are not deleted permanently. You can select items just like in other folders to perform actions like copying, renaming or moving. Tap the element and let go when the colour changes to blue and a tick appears on the left. Tap the action you want to perform. 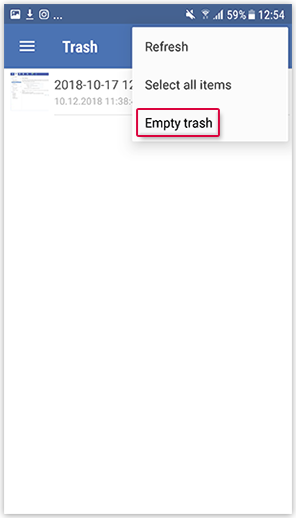 To delete the items permanently, tap Empty trash. Confirm the Empty trash? popup with OK. If you deleted items from the trash, they are not available on your other devices due to the cloud synchronization.